After a much needed break (AKA my job was basically forcing me to take daily afternoon naps…ask Roberto, he’s come home to me asleep more times than I can count), KBB is back in action! While I knew that this incredible baking job that I started back in November would be hella rewarding, I did not think that would still be struggling this bad with the 2:30am wake-up time! We allllll know that this girl LOVES the morning, I mean, I was waking up to do marathon training runs at 4am last summer, but to actually think at 4am is a totally different ballgame! I hope that everyone had an eventful few months—even though January-March have never been my favorite of the year, at least they’re just about over and we can focus on the best ¾ of the year!! Hi Spring! Hi Summer! Hi Fall! So, as we get into the most lovely, colorful, fully in bloom months, I have learned that here, in Atlanta, Spring isn’t exactly what I’m used to. To me, it’s rain, then SO MANY FLOWERS, cool mornings, mild days…but oh no, it was 85˚ this week…it’s still March. Ahh, at least there’s already beautiful tulips all over! Another plus to this wildly early summertime weather? Farmer’s Markets! They all begin April 1st! What?! YES! The bakery I work at is all about dem markets, meaning 3 days a week you can see us Lil’ Tarts representin’ our baked goodies around the city! Woo! Bring on busy season from April-December, I’m ready—insert muscle emoji here. Oh…but this isn’t just a blog where I chit chat for 3 pages, it’s actually about baking. And recipes. And slightly interesting content. So, while I mayyyyy have been MIA (or asleep) for that past few months, at least I came out of hibernation with this bomb recipe—a not-too-sweet cake with a surprise filling and an irresistible frosting! As (I hope) you all know, my cornbread is amazing. I’m not one to toot my own horn, but, like, it’s so good that I normally eat about half of it, mainly sneaking bites so that I don’t get that girl, are you going to leave me any?!?! look from my darling husband! Now this may be the next best idea I’ve had aside to my cornbread—turning it into CUPCAKES! Whaattttt. Dessert cornbread you say?! As it warms up, my sweet tooth goes down ever so slightly just because I’m too hot to consume anything that’s not butter lettuce, a green smoothie, popsicles and cold, cold pizza. Okay, sort of exaggerating but you get the idea, right? I came up with this subtly sweet dessert for moments just like described above, and it helps that it’s packed with orange zest to give a refreshing element to it! Hmm, how can we make it even better? Adding a Maine blueberry jam to the center? OKAY! Last, but not least, I had to add something chocolate, because, come on, it’s me…who are we kidding, right?! So all of this goodness is topped with a chocolate peanut butter buttercream…excuse me while I go scarf one down. So, as I came up with this ingenious idea to turn my cornbread slightly sweeter and force it to become a cake, I’ve also accepted the fact that it’s going to be a bit hotter than I’m used to for a lot longer than I thought possible, but, hey! Give me a box of popsicles, maybe a pint or two of Ben & Jerry’s and these cupcakes that are bursting with citrus, jam and chocolate, and I think I’m on board! 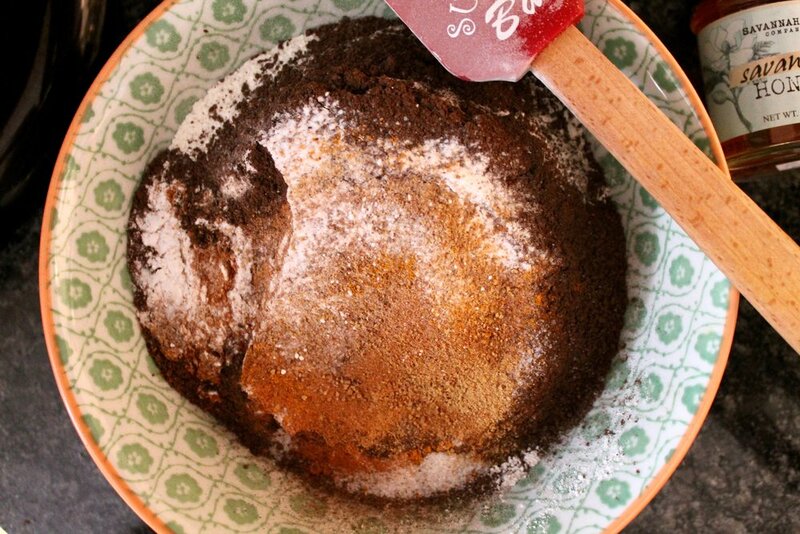 In a large bowl, combine both sugars, the flour, cornmeal, salt, baking powder and cinnamon. In another bowl, whisk together the egg, milk, olive oil and orange zest. Like a 12-count cupcake pan with liners. Fill each up about 2/3 of the way. Optional: sprinkle with coarse turbinado sugar for a nice crunch/texture before you bake. Put in your preheated over for 12 minutes, rotate, then another 15 minutes. Allow to cool completely before frosting them! In the bowl of your mixer, cream together the butter and peanut butter until very smooth. While this is creaming, sift together the confectioner’s sugar and cocoa powder. In another measuring cup, combine the milk and both extracts. Once your butters are nice and smooth, slowly add half of your sifted ingredients. Add in half of your wet ingredients. Add the final amount of confectioner’s sugar and cocoa powder, then the remaining milk/extracts. Turn your mixer up to about medium speed and allow to whip for a good 10 seconds, making your buttercream smooth and fluffy. Once your cupcakes have cooled completely, you may use this to frost with! As this first step you may omit, I highly recommend that you don’t! First, using a paring knife, cut out small little cones out of the center of each cake. Fill them with jam—I have used a Maine blueberry jam, but any kind will work! I find that orange + blueberry complement each other oh so well! Once each center has been filled, use either just an offset spatula or piping on a nice dollop of buttercream using a round tip, to both completely cover the jam as well as add a good 2 TBL of it on top! This can be as messy or as clean as you’d like—all depending on your technique and preference! I have used a medium-sized round tip in my pastry bag to cover the jam with the buttercream, and then also to put enough on before spreading out with the offset. Finish with any type of sprinkle or sugar that you’d like, or just leave plain as is!